He immediately dispatched his finest warrior, the now-elderly Hang Tuah, to Gunung Ledang, together with other captains such as Sang Setia and Tun Mamat. As they ascended the mountain, they were struck by a strong wind and could climb no further. Tun Mamat bade Hang Tuah and the others to stay, while he and two or three other men travelled on. Tun Mamat climbed further, pass thickets of singing bamboos and reached a point where the “clouds seemed so close as to be within reach”. He finally came upon a beautiful garden, where he found four women and he told them of his quest to find the fairy princess and presented the Sultan’s marriage proposal. One of the women, Dang Raya Rani, said that she was the Guardian of the Fairy Princess and would tell the Princess of the Sultan’s wish. After saying this, all the women vanished in thin air. Later that night, there appeared an old woman, bent-double with age, who told Tun Mamat that if the Raja of Melaka desire the Princess, let him make for her a bridge of gold and a bridge of silver from Melaka to Gunung Ledang. Pires' Suma Oriental lends some credence to the Gunung Ledang fable when he mentions "the enchanted queen in the hill of Malacca called Gulom Leydam (Gunung Ledang) ..... where there are only women, and they have no men, and that they are got with child by others who go there to trade and then leave, and others are made pregnant by the wind ...."
There is a whole chapter on Gunong Ledang in Eredia's 'Description of Malaca' (1613), where he describes her as "the Oueen Putri, the companion of Parameswara, founder of Malacca .... and to Gunoledam retired the Queen Putri and here the enchanted Putri remains forever immortal and here she lives to this day by her magic arts. She makes her home in a cavernous cave on the summit of the mountain and here she lies on a raised couch decorated with dead men's bones. She takes the form of a beautiful young girl, adorned with silk and gold." Eredia describes the cave as "planted with thickets of bamboo, from which proceed harmonious voices and sounds of flutes and other musical instruments." The ‘Sejarah Melayu’ also mentions these "singing bamboos that birds on the wing stopped to listen to and every creature that heard it was enchanted ...". Eredia also says that surrounding these thickets are forests are occupied by tigers who guard the Putri. He goes further by saying that "the Banuas ('orang benua' or Orang Asli) learn their magic arts in this cavern at Gunong Ledang and use these arts to transform themselves from human form into tigers, lizards, crocodiles, birds and other animals". Eredia relates that so many of these were-tigers came in the night into Melaka and killed women and children that the first Bishop of Melaka, Dom Jorge de S. Lucia, solemnly excommunicated these 'tigers' in a High Mass in 1560! 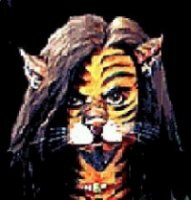 R O Winstedt's study of the occult in his "The Malay Magician" also mentions "a were-tiger that guards the fairy princess of Mt. Ophir". He further adds that she was said to take the form of a girl in the morning, appears in noon as a woman and at night as an old hag. Even in the ‘Sejarah Melayu’, Tun Mamat never ever actually meets face to face with the Putri Gunung Ledang but speaks with an old woman "bent double with age ... and the old woman who spoke with Tun Mamat was Puteri Gunung Ledang herself in disguise." Winstedt records local folklore telling how she would take the form of an old woman carrying a cat and some 'kunyit' (saffron or turmeric) and ask the boatmen on the Gemenceh River for passage - if it is refused, the boat eventually runs aground, if she is taken aboard, it glides along the river more swiftly than usual. When she leaves the boat, she would give the boatman some saffron, which would turn to gold in his hand! Johor traditional folklore says the fairy Princess was married to the legendary Malay seafarer Nakhoda Ragam. While they were sailing in his boat somewhere off Melaka, Nakhoda Ragam one day playfully tickled his wife’s ribs while she was sewing and, in an uncontrollable reaction, the Princess inadvertently stabbed her husband in the chest with the needle, killing him. The Princess returned to her home on Gunung Ledang and vowed never to set eyes on another man. Nakhoda Ragam’s boat was left empty and deserted, floundering on the Straits, and was one day crushed by a storm and sunk. 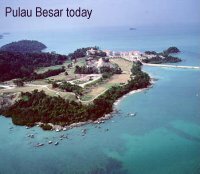 Legend has it that debris from the wreck were magically transformed into the present six islands off Melaka. The boat’s galley became Pulau Hanyut, its cake-tray became Pulau Nangka, a water-jar became Pulau Undan, the incense-burner became Pulau Serimbun, the hen-coop Pulau Burong and the cabin of the two lovers became Pulau Besar. In his book 'Shaman, Saiva and Sufi', Winstedt said that after his death from the prick of her needle, she donned fairy garb and flew to Gunong Ledang, whence she migrated later to Bukit Jugra further up the coast with a sacred tiger as her companion. Another traditional version of the fable believes that the princess had seven sisters who were from Java, as well as other relatives in Johor, including Puteri Gunung Banang in Batu Pahat, Puteri Gunung Panti in Kota Tinggi and Puteri Gunung Beremban on the border between Johor and Pahang. It is said that these princesses cannot normally be seen by human eyes but people who have lost their way in the forest have on occasion met and talked to them. 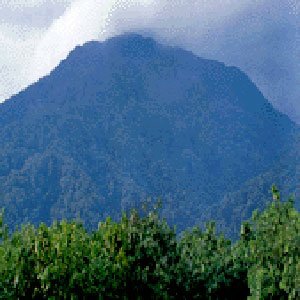 Another oral tradition has it that Puteri Gunung Ledang stayed at the top of the mystical Gunung Mahligai and had a lover, a jinn prince, who lived on top of Gunung Rundok. As a result of a curse, the two were banished to live alone on the summit of these mountains and could not leave their respective mountains. However, so strong was their love, it was said that the summit of Gunung Rundok would, every night, tilt towards Gunung Mahligai, and the two lovers would meet and spend the time together until the break of dawn, when the two summits would be separated again. One night, while they were together, they did not realise that time had passed and this caused the summit of Gunung Rundok to remain permanently tilted, to this day. It is said that if one were to climb Gunung Ledang from Kampung Asahan in Melaka, one will encounter a deep crater before reaching the mountain top. This large crater was believed to have separated the two mythical mountains of Gunung Rundok and Gunung Mahligai. 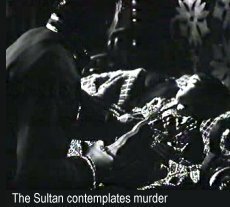 A film version of the Puteri Gunung Ledang fable, directed by S Roomai Noor in the 1960s had the princess come to the Sultan's chambers in the dead of night in his dreams. Not knowing who she was, he summoned the Royal Astrologer, who tells him that it was indeed the Fairy Princess of Gunung Ledang. Hang Tuah led a team up the mountain but the elderly warrior retires to a cave in exhaustion and urges Tun Mamat on in the quest for the Sultan. Tun mamat encountered the famed were-tiger, whom he manage to trap in a pit. He also encounters a group of hostile Orang Benua, whom Tun Mamat defeats in battle. Tun Mamat eventually meets with the Princess's Guardian Dang Raya Rani, a bevy of four beautiful fairies and the Princess herself. On hearing of the impossible conditions set by the Princess for her dowry, Hang Tuah feels his promise to the Sultan cannot be fulfilled and vows not to return to Melaka in shame. He throws his kris into the Sungai Duyung and descends into the river's depths, vowing that Hang Tuah will only ever step on Melaka soil when the keris floats upon the river surface. The Sultan agrees to the Princess's demands and cruelly oppresses the people of Melaka in his quest for the gold and silver needed for the bridge. Wracked with madness, he draws his keris to kill his son for the cup of blood required but, as he is about to plunge the blade, the Princess magically appears and swears that she will never marry a man who is so weak and cruel as to oppress his people and murder his own son.